The PVI multifold portable wheelchair ramp offers the length required for wheelchairs or scooters to access vans and minivans with ease. The unique 3-fold design provides the compact storability and portability previously available only in smaller ramps. 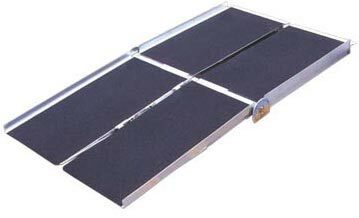 This lightweight portable ramp is made of aluminum and features nonskid driving surface and built-in carrying handles. The ramp separates into two lightweight sections for easier handling. The ramp unfolds to a 29� wide platform and features an 600-pound weight capacity up to 8' in length and a 500 lb capacity for the 10' & 12' lengths. Weight: 30, 35, 39, 52, 63 or 73 lbs.